Trotsky wrote this article after attending a highly-touted rally at Carnegie Hall of groups opposing American entry into World War I, just days after Germany had declared unrestricted submarine warfare against American shipping and President Woodrow Wilson, in response, had severed American diplomatic relations with Germany. Though it does;t mention him by name, the article was intended as a slam against Morris Hillquit, leader of the Socialist Party in New York City and the principal speaker at the rally. 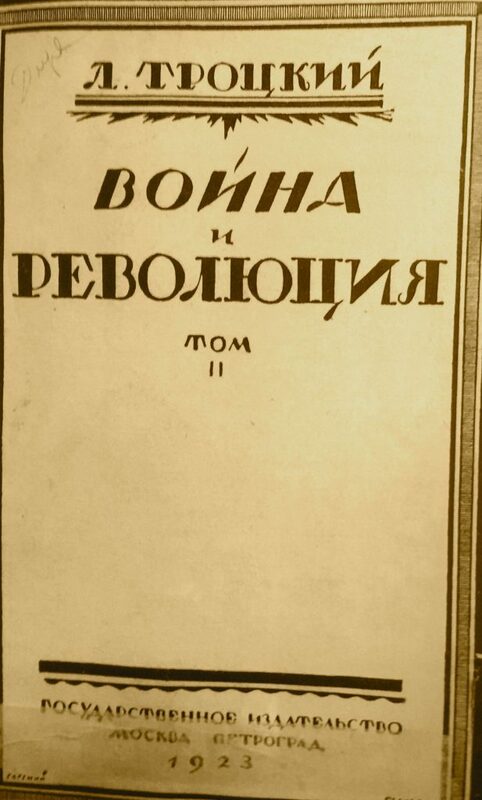 The article appeared in Novy Mir on February 8, 1917, and later was included in a 1923 collected called War and Revolution. Here it is translated from the original Russian:. “The official socialist campaign against the war kicked off on February 5th with the impressive meeting in Carnegie Hall. From a political and organizational standpoint, the first presentation was weighted down by a huge mistake: the meeting was organized by the socialist party in conjunction with bourgeois, priest like pacifists (“Friends of Peace”). The reason for that, as they said, was “circumstantial”: the only suitable venue, Carnegie Hall, had already been rented out to the bourgeois pacifists, and our party found it impossible to delay the meeting any further. However, regardless of the practical significance, we consider it necessary to state that the price for the opportunity to conduct this meeting at Carnegie Hall was too high. The socialist party was forced to present in a single rank the people who sincerely protest against the war today, and tomorrow, when they hear the first shot, will gladly call themselves good patriots and, following the example of all European bourgeois pacifists, will start supporting the governmental machine of mass murders, persuading the crowds that in order to reach “fair peace,” “lasting peace,” and “eternal peace,” it is necessary to fight the war until the end. When presenting together with the people who still have Wilson as their predetermined appeaser of the nations, we confuse the message and mislead the crowd. Meanwhile, in reality, and not for show, for revolutionary, and not a flashy fight against the war and militarism, the working class needs first and most of all a clear class-consciousness. “The first mistake led to a second one: both rendered resolutions, the socialist and pacifist, were voted on conjointly. Although, it was apparent from the meeting spirit that the vast majority of it consisted of the revolutionist working class, it did not find its reflection in the voting pattern, and the revolutionary aspect of the meeting was weakened, both psychologically and politically. “On the other hand, we were very satisfied with the actual text of the resolution put forth by the official orators of the socialist party. However, it did not state everything we wanted to convey, and some of the points are extraneous. Nevertheless, the overall resolution is a principal internationalist document, and under the given circumstances, is also a revolutionary act, or at least a preface to it. “If the resolution states that ‘the war will weaken the most noble traditions of this republic,’ then the only thing left is to note that the ambiguous pleasantries toward the traditions of the bourgeois republic would be more appropriate in the bourgeois pacifists’ resolution: they will start proving to the people, just like the French pacifists, that it is necessary to smash Germany in order to save the “republic’s most noble traditions”. Our proletarian republic does not dwell on the past – it is all in the future. “The resolution states – and beautifully states – ‘the threatening war will only serve the selfish capitalists’ interests of that country.’ These interests are called by name in the resolution: the fight is going on because of the ‘sacred right of the American capitalists to fatten up on the misfortune of war-struck Europe.’ In this light, the resolution states that ‘it is a great hypocrisy that President Wilson informs Congress that we are not going to serve the egotistical goals.’ The greatest hypocrisy is well stated, and more importantly, it hits the nail on the head of those pseudo-socialists, who replaced (partially or entirely) their socialist colors with the colors of Wilsonism. Socialism assumes an organized uprising against the bourgeois society. Socialist policy is an organized [Page 381 of Source Text] distrust for the bourgeois parties, their leaders, and the governmental bosses. “The means at the command” of the working class are entirely determined by its role in capitalist production and its position in the modern state: they are provided by the historic experience of the proletariat’s class war in its highest, most rigorous forms. The resolution calls us to fight in this very direction and widens the stream of the movement by increasing its political ideological and political swing and increasing its combative intensity. Comrades see that the socialist party’s resolution is content-rich. This is a fighting call to action and a guide. However, it is also a big responsibility, which the leading party circles assume. We will watch that this obligation is fulfilled to the very end – without any weaknesses, compromises, and doubts!